Recently, my Scottish friend Ruth (a Paisley girl) posted the picture below on my Facebook wall. 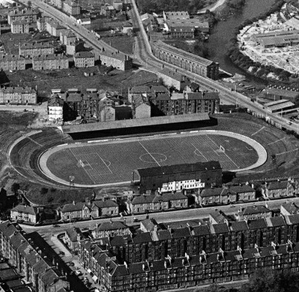 It's a shot of the old St.Mirren Football Ground in Paisley, taken sometime in the 60's I believe. I've never been there and it's been knocked down now. 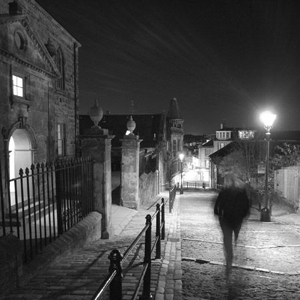 But it was called LOVE STREET - which conjured up all kinds of nostalgic images in my overactive romantic head. So I wrote the poem below. No doubt the music will follow shortly ... Of course when you read ... it's pronounced Loooooove Street! On the old sunnyside where we used to meet. ‘Cept how to laugh and how to cry and how to run and how to sing! ‘Neath the old station clock, she was dressed real neat. As the driven snow, as glassy ice, as silky skin and cool allure. To walk that street again in spring, with the girl I love to kiss. At the Club ‘O’ Shady, with the banga beat. Of sunrise gold, of foxy turn, of windy warm and dewy lawn. At the old St.Mirren in the summer heat. Within a team, within a band, with a voice of many tones. Wicked! ok, now the song! Yes and the song is now completed and will be released this spring! !